StereoKimono are an Italian band that intentionally avoids labels by classifying themselves as "Psychophonic Oblique Rock". I like that description as the band is indeed difficult to describe, being essentially a prog rock band but also drawing on jazz fusion and space ambient influences. The music is all instrumental and is played by Antonio Seferi on guitars and keyboards, Alessandro Vittorio on bass and keyboards, and Cristina Atzori on drums and percussion. The CD opens with "Eh! Ah! ", consisting of progressive rock with imaginative and continually shifting rhythms. Most of the song has a full heavy sound, but near the end there's a short melodic fusion segment. But there's also lots of spacey bits throughout that give StereoKimono a somewhat different sound. "Istanbul Di Giorno" is similar, but heavier rocking and perhaps the most thematically complex and exciting song of the set. These are the two songs that would probably most appeal to the prog rock crowd. "Apoteotico", "Il Nulla Respira", and "Per Vederlo Devi Chiudere Gli Occhi" are all intense but rhythmically playful tunes, the latter including various ethnic influences. Kind of a prog and fusion Flamenco sound if that makes any sense. My personal favorites are "Phileas Fogg" and "L'Altra Marea". "Phileas Fogg" is atmospheric and even a little bit trippy, but with a jazz fusion base. The music journeys along like this for about 7 minutes or so until launching briefly into a funky rockin groove, and settling into the last couple minutes of what I found to be the best part of the song. The band is still in fusion territory but they're rocking a little harder than the earlier part of the song, still incorporating the atmospherics and embellishing the music with more of the freaky space electronics that so nicely peppered "Eh! Ah!". But I felt like the songs opening theme went on too long without enough development so it could probably have been tightened down by a few minutes. But it's still a very nice track. The first 3 minutes of "L'Altra Marea" consist of a guitar and synth freeform jam. Imagine some of the freakout moments from Hawkwind's Space Ritual but more polished. Then the band launch into one of the cosmic fusion jams that I'm starting to identify as being their best moments. The guitar, bass, and drums are based in an easy-paced prog/fusion realm, but the guitar and keyboards also spice the music with all manner of atmospherics and even downright space freaky sounds. Definitely the strongest track on the disc. In summary, StereoKimono have a different sound, though not necessarily identifiable due to the variety of music across the tracks. But overall this was an enjoyable set and I really like the way the band blends prog, jazz, and space influences. I hope to hear more from them. 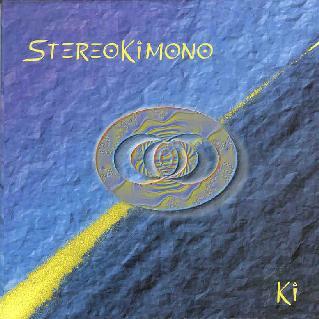 For more information you can visit the StereoKimono web site at: http://www.stereokimono.com/. Ki is distributed by the Sublime Label. You can visit their web site at: http://www.sublimelabel.com. Contact via snail mail c/o the Sublime label;c.p. 50; 41050 S. Vito MO; Italy.